Anyone who has pets knows that the battle of keeping them away from the trash just comes with the territory. 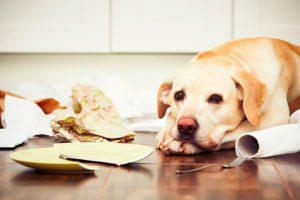 If there are any type of meat remains in your bin, good luck keeping them away, and even the best trained dogs find certain food items irresistible. I have had more than one Thanksgiving evening with my mischievous dog locked in the bathroom just for the sake of keeping him away from the turkey bones in the trash. A trashcan with a lid seems like the simple solution, but very determined or large dogs have no problems attempting to knock those over to get to what’s inside, and often times succeed. Somewhere in the middle of scooping up the slimy remains of the scraps of the past few evenings’ dinners, I decided enough is enough. 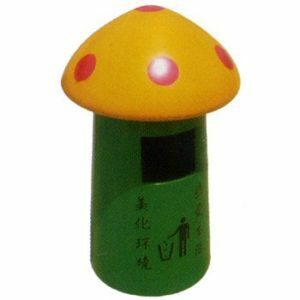 It’s necessary to find a trashcan that is completely animal proof to prevent a lot of future headaches for yourself. A secure lid: The lid itself is a no brainer, but do you think that’s enough to keep Rover out of the left over bacon crumbs? Think again. It’s necessary to have a lid that closes tight. This will also help with keeping the tantalizing scents locked away that your dog finds so tempting. A pedal: Most dogs won’t be able to figure out how to maneuver this tricky human contraption, and the average dog isn’t tall enough to reach what’s inside even if they do somehow get their paws on the pedal. A latch/locking mechanism: If your trashcan doesn’t have a pedal or latch, it can still be dog-proof, but if this is the case, a locking device is absolutely essential. Even the smartest of canines won’t be able to figure out how to get through this. This trashcan looks stylish, especially the black model, and has two features that will protect it from dogs (or cats for that matter). 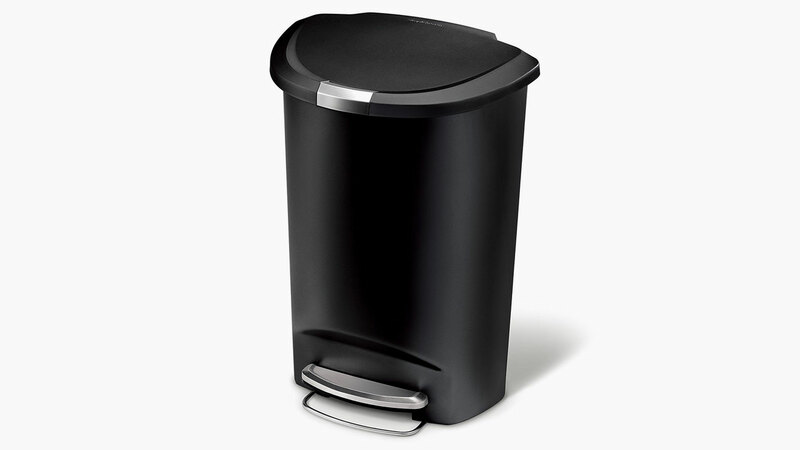 The simplehuman Semi-Round Step Trash Can has both a latch and a pedal. This product is sturdy which makes it harder for your animals to knock over, and designed in a way that even if they do, the ugly dents won’t show. Though it is sturdy, it’s also light enough to move easily if necessary. It comes with a guard on back that keeps it from hitting and scratching your kitchen wall, and it’s easy to clean. It’s a little difficult to get the lid on when you are first assembling the trashcan, but once it’s on, it’s not a problem. This model comes in stainless steel, meaning your pet won’t have an easy surface to grip when he tries to find a way to knock it onto its side to get to your trash. Smaller dogs have zero chance at all with this, because the model is quite tall. 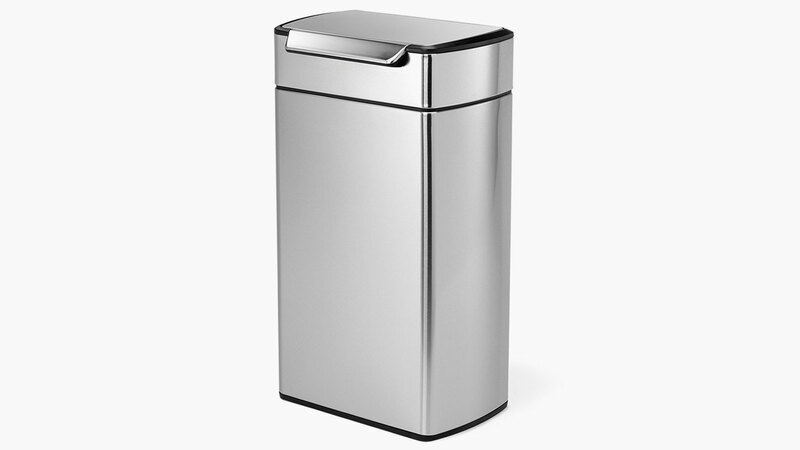 The simplehuman Rectangular Touch-Bar Trash Can won’t need to be replaced for a very long time. There are no foot controls, but this isn’t necessary since you only have to press on the top bar of the bin to open the lid. Although you do have to touch the bar for the trashcan to open, you won’t leave fingerprints on this bin, which is another great feature about it. The lid stays open until you decide to press it shut, so this takes away any hassle at having to open it each time for repeated use. Your pet will have a hard time breaking into this one. This one is pretty unique because it’s made from solid wood rather than metal or plastic. This gives it a very homey look, and it’s square shape ensures that it’s impossible to knock over for dogs or even adventurous toddlers. The Brylanehome Country Kitchen Trash Bin has a lid that you open manually, which means it stays open as long as you need it to. With a lot of trashcans, you have to empty it out when it’s only half full, or it won’t close correctly. The design of this model allows you to wait until it’s completely full to change the bag inside, ensuring less hassle for you and less wasted trash bags. The lid opens with a knob, meaning that thumb-less pets won’t have an easy time trying to break into it. The instructions on how to put it together could be a bit more clear, but it’s not hard to figure out how to assemble this trash can, and once you get it put together, it’s very sturdy. This bin has what you’re looking for right in the name. The Rubbermaid RMF8201 Thirty Two Gallon Animal Stopper Trash Can is literally impossible for your furry friends to conquer. I’m sure they will still try, but the lid is designed to only open for humans. 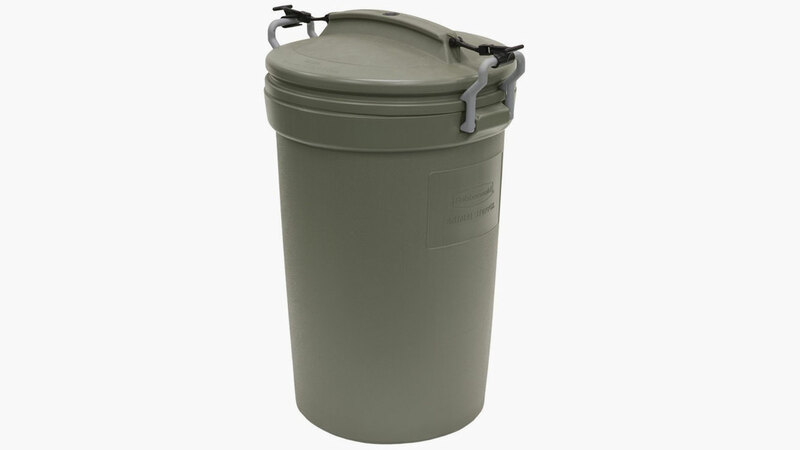 If you have a possum or raccoon problem, this bin can be used outdoors to protect against wild animals, or placed in your kitchen to protect against your own pets. It does have a narrow bottom which could make it easy to knock over, but the locking lid makes it so that even if this happens, your animal won’t be having a trash feast and you won’t be cleaning up a mess. This is a great option for someone who has tried different trashcan models and still hasn’t been able to find one that keeps their dog out. This trashcan has a dog-proof pedal, and is very tall, which are two pluses when it comes to keeping pets out. 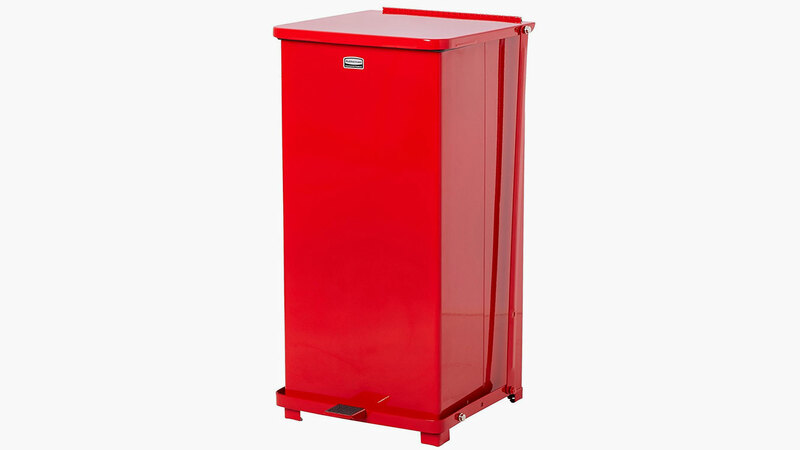 The Rubbermaid Commercial FGST24EPLRD is sturdy and solid, meaning that it won’t knock over easily. It seals with rubber, meaning that the trash scents stay locked inside of the bin where they belong. This Rubbermaid model comes with a removable liner for easy cleaning, and is heavy enough to be impossible to knock over for your dog, but light enough to be moved when you need it relocated. It’s designed so that even if you have it right up against the wall, it won’t slam into the wall each time you open it, which is good news for both your wall and your ears.